This week’s Photo Challenge is The Sign Says. On May 20, 2011, during our multi-day paddle down the Hudson River from Albany to New York City, we landed in the town of Highland for a meal in a riverside restaurant. And we saw this sign, promising Judgment Day for tomorrow. Devastating earthquakes were predicted to usher in the Rapture! This entry was posted in Humor, Photography and tagged Judgment Day, Photography, postaweek, postaweek2013, The Sign Says, Weekly Photo Challenge. Bookmark the permalink. That is so funny!! I love seeing signs like that. Have a great weekend. Laugh out loud, as Jesus said, no one but God the Father knows when the end will come, not even Jesus himself. Yet, many televangelists and other fundamentalist preachers insist on predicting the date. Thank you so much for posting this. It’s simply bittersweet. That would be an unexpected adventure, for sure! Some things just can’t be prepared for! Well, that depends on your theology! Pingback: Weekly Photo Challenge: Signs (Brevet du 7 Cols Ubayens) | What's (in) the picture? i’m so happy that Judgment Day has been postponed! Haha! 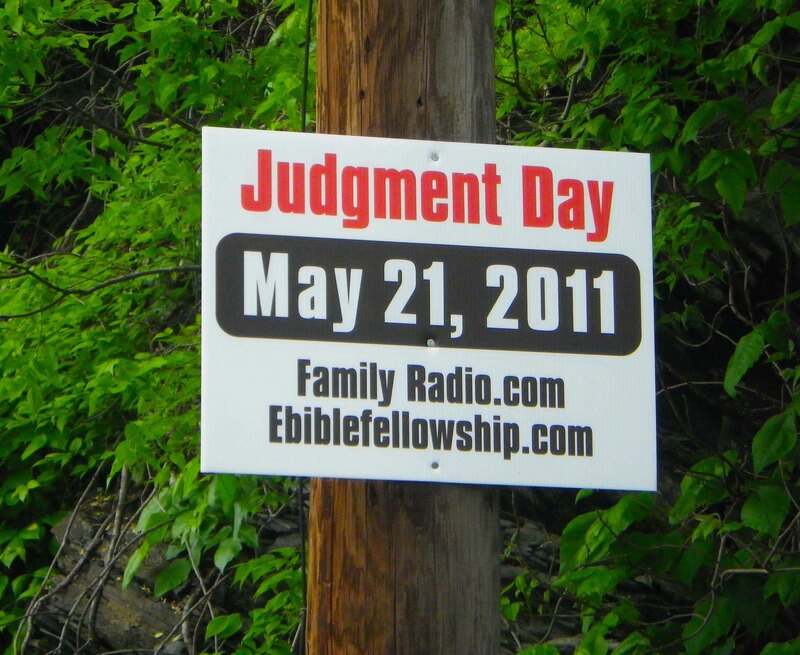 At least you gotta give them credit for spelling ‘judgment’ correctly! Pingback: Weekly Photo Challenge: The Sign Says (Bibracte and Julius Caesar) | What's (in) the picture? The end of time comes to us when we close our eyes for the last time. Pingback: Weekly Photo Challenge: The Sign Says (bicycles go where?) | What's (in) the picture? Pingback: Weekly Photo Challenge: The Signs Say (My Name! Well, almost) | What's (in) the picture? How one sign can tell an entire story. Nice. Pingback: Weekly Photo Challenge: The Sign Says (What happened to faith?) | What's (in) the picture? hahahahaha isn’t this the greatest weekly challenge topic!? I swear!! there is no end to the craziness out there! Great sign! I love that it gives a specific date–for the end of the world! Thanks for dropping by my blog earlier. Great sign you got here, put a wide grin on my face. Good! Thank you for stopping by! Pingback: Weekly Photo Challenge: The Sign Says (Puerto de las Palomas) | What's (in) the picture? Pingback: Weekly Photo Challenge: The Sign Says (Sign Revisited) | What's (in) the picture?